If you’re self-employed, you probably can’t count on a steady paycheck. But you still need to save for retirement, so how can you make that happen? This is Part 2 of a series for business owners. Part 1 compares several different types of retirement accounts for self-employed individuals. People with “normal” jobs have it easier – they earn the same wage every month, so it’s easier for them to plan and set aside a few bucks for retirement each month. When you’re self-employed, saving for retirement is a bit trickier. Your revenue probably changes from month to month, and you have large (sometimes unexpected) expenses spaced throughout the year. With that in mind, here are a few different ways to save for retirement when you’re self-employed. Any of these is a decent approach – the trick is to find the one that fits, given your business, your personality, and your worldview. The simplest approach, and the one you’ve probably avoided due to its drawbacks, is to set up automatic contributions to your retirement accounts. Do some retirement planning, figure out how much you need to save each month, and have it transferred to your account automatically every month. The problem with this approach, of course, is that you can get into trouble. The timing of your revenues, slow periods, and large business expenses can leave you short on cash. Unless you keep more than enough cash on hand, you might find that you have to pay a little too much attention to things if you go this route (and that defeats the purpose of automating). 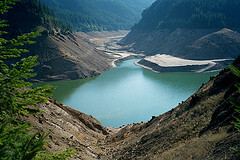 This reservoir is at low water, for now. To solve the problem, you can create a buffer of cash with the goal of using it for retirement savings. To do this, simply build up enough cash so that you can easily make several months (or more) of retirement contributions – and comfortably expect that the well won’t run dry. Once you’ve filled your reservoir, go ahead and set up automatic contributions and be done with it. You may worry that waiting will ruin your retirement. Isn’t it important to take advantage of Dollar Cost Averaging? The fact is that retirement saving is a lifelong endeavor. The most important thing is to have a plan and put it into place. Building up a cash reservoir so that you can invest in a disciplined manner (with more certainty and regularity) qualifies as “putting it into place.” Do whatever it takes to ensure that you can invest over the long term – it’ll be okay if you miss a few months. Tip: It doesn’t matter when you invest this year; it matters that you invest every year. Another approach is to build up cash throughout the year and save later. Once you see how things have gone, you can make a large one-time contribution to your retirement account. Of course, this requires that you actually make a contribution each year – and that’s slightly less likely if you don’t automate the process. Is there anything wrong with investing once per year? It depends when you invest, but it’s not the worst thing in the world. Even if you happen to buy on the worst day of the year (when the market is at its highest) – every year – you’ll be okay as long as you save more or less what you needed to save to (according to that plan you made). I’m too lazy to do the math on this for you, but others have done it. Ric Edelman calculates that the difference between investing all of your money on the best day each year versus the worst day is about 1.1% per year. That is, your lifetime average annual return would be 1.1% higher if you were going to invest on the worst (highest) day every year, and you somehow switched to the best (lowest) day to invest. But here’s the deal: you weren’t investing on the worst day anyway (I don’t care how unlucky you are, you can’t do it every year), and there’s no way you’ll figure out how to invest on the best day. Most likely, in some years you’ll be lucky, and in other years you’ll be unlucky, but things should average out over your lifetime. Now, it would probably be better to spread those contributions out and make more than one investment per year, but it’s also probably less important than you imagine. If it works for you, you can always make more frequent contributions (quarterly, twice per year, or whatever). You’ll have a better chance of buying low, and you’ll have the opportunity to earn income more days out of every year. If you want to smooth out your contributions, you can always do a combination of the strategies above. Set up an automatic monthly contribution that you know you can afford, and then dump in a little extra when you find yourself holding onto more cash than you need. A final approach is to contribute to your retirement plan every time you make a sale. Obviously, this is not practical for most businesses. But if you make large, infrequent sales – and you can successfully remember to contribute – this might be a good option for you. Just add it onto the end of your sales cycle: you deliver to the customer, receive payment, and put some away for your retirement.